It's hard to skip prototypes (or the prototype chain or prototypal inheritance) if you want to dive deeper into JS development (Not only pure JS, but also Node.js, Frameworks like Vue.js, React.js, Angular,...). Refer back to the below illustration whenever you feel the need, it might help you to wrap your head around this concept easier. The private prototype object can be accessed with Object.getPrototypeOf() (to get the private prototype property) and Object.setPrototypeOf() (to set the private prototype property). Additionally you can also use __proto__ in some browsers to get and set this prototype. In my opinion, things are easier with examples. So let's take a string to demonstrate how the prototype chain works. As we can see, our variable name has it's private prototype property set to String, so we can use methods like name.charAt() without the need to define them on our name object directly. 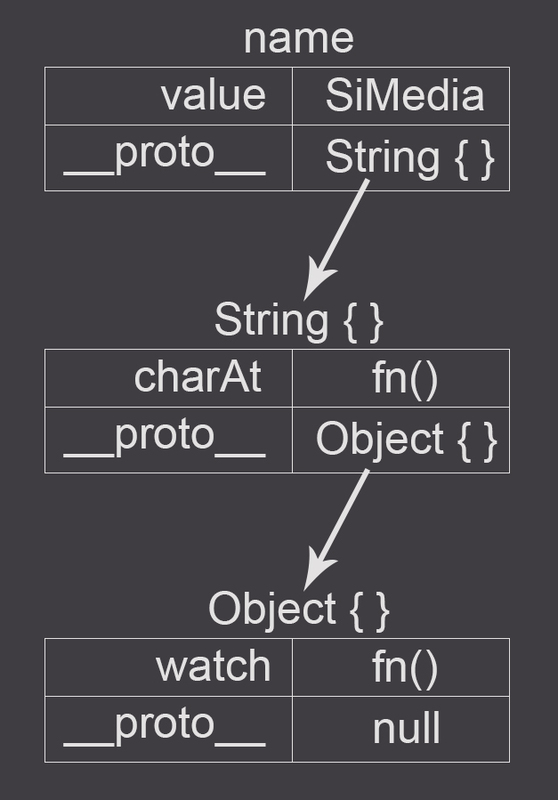 In the above example, the String.prototype object also has a private prototype set to Object.prototype (this happens, because String.prototype already inherits by default from Object.prototype. This allows us to use methods like name.watch(), even if the method isn't defined on the name object nor on the String object. This prototype chain could go up indefinitely, until the chain reaches a private prototype property set to null (as it is the case for Object.prototype). Now we know, that each object has a private [[Prototype]] object, which references another object (or null) and allows us to inherit methods and properties almost indefinitely. Whenever we define a function, this function automatically gets assigned a property prototype, which by default will be set to an object containing two properties. constructor, which holds a reference to the function itself and __proto__ which references the private [[Prototype]] object for this object (or null). We can verify this with the following code (You can test this in your browser console or in a Node.js app). // Just an empty function, to keep things simple. So what is this prototype object? The above function can be used (as every function) to construct a new object. If we create a new instance by using this function, the private [[Prototype]] property of that new instance will be set to reference the prototype property of the constructor function. As you can see, the private [[Prototype]] property of tesla is the same as the prototype property of the Car constructor function, because by calling new Car(), the tesla object gets it's private [[Prototype]] set to the Car.prototype object. It's considered good practise, to add methods and static properties to this prototype object, as this way the methods won't be added to each instance separately, but instead they will be created only once and can be shared across multiple objects. This can save a lot of memory, depending on how many instances and methods youhave. The prototype chain, as you might have already guessed, is being used to inherit methods and properties from other objects. But how do you actually set up the inheritance? As we have learned above, we can set the private [[Prototype]] property of an object by calling Object.setPrototypeOf() or by using the __proto__ property. In line 1 we declare our Car constructor function. It won't do any assignments, to keep things simple. Line 3-5 adds the function drive to the Car prototype object, which logs to the console. Line 7 defines our Tesla constructor function. Again, we won't do any assignment, to keep things simple. Line 11 creates a new object from the Tesla function constructor. Remember, that we set the private [[Prototype]] of Tesla.prototype to reference Car.prototype. And when instantiating, the Tesla.prototype will be added as the private [[Prototype]] to our new created object. This way, we will have access to all functions and properties, which were attached to Tesla.prototype and Car.prototype. When inheriting, it's often required, to override a method or property, which came from an inherited class (or constructor function). In prototypal inheritance, this is called shadowing. Let's imagine for a second, that we don't want our tesla object to only drive, but instead flowing smoooth on the street. Maybe we use a 3rd party library, which provides us the Car base class and it's good practice, not to override 3rd party prototypes. So the only way to replace/extend our drive method from Car, is to add a method drive to the Tesla prototype object. tesla.drive(); // The tesla is flowing on the street smoothly. Notice, it's important, that you call Object.setPrototypeOf() before adding new methods to the Tesla.prototype object, as they will be overridden otherwise. But what, if we want to call both methods? Add the following snippet to the Tesla.prototype.drive method, wherever you want the code from the inherited class to be executed: Car.prototype.drive.call(this). This will call the drive method of Car.prototype and bind it's this keyword to the object you are currently interacting with. // The tesla is flowing on the street smoothly. We saw, that each object has a private [[Prototype]] property, which defines, which object we are inheriting properties and methods from. We also saw, that functions have a prototype property, which is an object, that gets set as the private [[Prototype]] property of instances created with that function. There is a lot more you can learn about prototype. If you understood the above principles, I recommend you red through the MDN Documentation and get your hands dirty by experimenting. If you have any further questions, aspects you are unsure with or found anything, that is incorrect in this article, don't hesitate to leave a comment below or reach out to me on Twitter: @ivansieder.